Last week, I wrote about a WMI persistence attempt, where an attacker can use the WMI scheduler to effectively hide a scheduled task within WMI. Today, I’m going to talk about another use of WMI that was in Matt Graeber’s paper: remoting. This is another thing that I suppose will happen from time to time in an environment, but I’m guessing it’s fairly rare given the plethora of remote administration tools out there. This is a standard logon/logoff event, and you’ll see this pretty much every time something logs on to your system. On it’s own, that’s going to be a noisy event, but often times with this kind of stuff, the devil can be in the details, and I think the highlighted information may have some clues that there’s something on that shouldn’t be. For one, this isn’t a standard RUNAS command, as the event ID implies. I tested this on the same system, but doing a local RUNAS will have the account name you used listed, but it will also have a target of localhost. The additional information will also say local host. The process name is also somewhat telling here, being svchost. While it’s not unusual to see svchost in a process, this event is telling us that svchost is making a remote procedure call. It’s probably worth noting that there was another 4648 on the same machine that told a bit more info about what I was doing, but I’m not sure it has anything useful that I could alert off of. 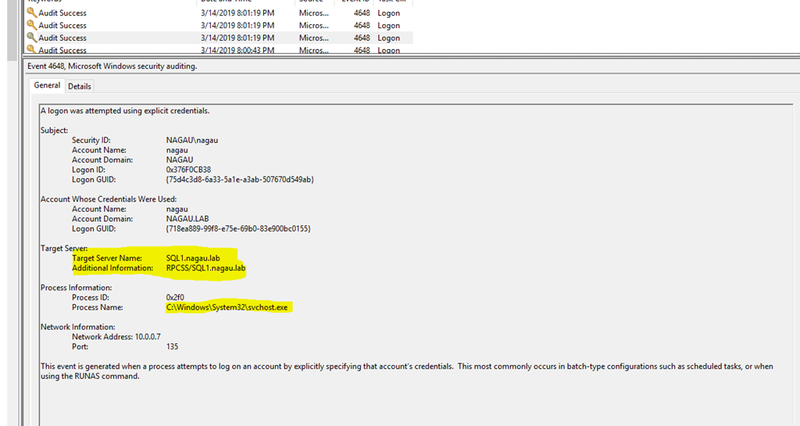 We can see from that event that I’m also targeting a remote server and that I’m using PowerShell_ISE to run the command, but ultimately an attacker is will be using their own tools, and if I knew the name of said process, I could just target that. This particular event might be something worth searching for if the top event appears. Note: For this to work properly, the process command line GPO MUST be set, otherwise, it will screw up the parameters. I’ll let these bake and see if they make noise. Happy SCOMing. Update 3/19 – SCOM can actually trigger one of these rules. It’s not surprising on investigation as SCOM will periodically have to restart the health service when it takes up too much CPU/RAM. Since my DC is chronically under-speced, I’m not surprised to find SCOM doing this. Anyways, I’ve updated this rule to exclude SCOM’s remote WMI attempt.